If you have been in Catholic or Protestant churches, you will have seen that worship there as a rule consists of various bits and pieces: first people sing a psalm then sit, listen to a reading, then stand again. Worship in the Orthodox Church is uninterrupted. This of course helps us to immerse ourselves in the prayerful atmosphere. Our worship is a school of theology and contemplation, it is replete with theological ideas. It is completely impossible to understand worship without knowing, for example, the dogmas of the Church. This is why Orthodox worship for many people appears to be incomprehensible – not because it is in Church Slavonic, but because it appeals to the consciousness of completely different people. On the other hand, Hilarion is on to something when he says that the Byzantine liturgy “appeals to the consciousness of completely different people” than one is likely to find in most Catholic or Orthodox parishes these days. Hilarion explains further. Let us suppose that people come to listen to the Great Canon in the first week of Great Lent. The canon may be read in Church Slavonic or it may be read in Russian, but the effect will remain the same, because the canon was written for monks who knew the Bible practically by heart. When a name was mentioned in this canon, then in the heads of the monks there immediately arose an association with a Biblical story which here was interpreted allegorically in relation to the soul of the Christian. This is all undoubtedly true. Although there are Christians today with a fair amount of Biblical sophistication who can pick up on the Great Canon’s allusions (and the myriad of Biblical and doctrinal allusions found throughout Byzantine hymnography), they are, arguably, few and far between. 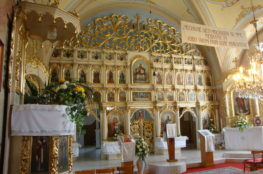 Even without linguistic barriers, most Byzantine Rite adherents are accustomed to one or more “spiritual” interpretations of the liturgy, many of which were manufactured over the centuries in isolation from the original meaning of the various Byzantine liturgical texts. Moreover, where such “spiritual” interpretations are missing, the faithful are often left to develop their own, subjective, interpretation of the liturgy, infusing their own spiritual needs with what may (or may not) be conveyed in the texts themselves. Hilarion has more to say on this in the context of the Great Canon of St. Andrew of Crete. Accordingly, people come for the Great Canon, they listen to what the priest is reading, but basically they are responding to the refrain of “Have mercy upon me, God, have mercy me.” And each stands with his own prayer, his own repentance, which in itself is of course good and important, but it is not quite what the Great Canon was written for. Therefore, in order to understand worship, in order to love it, it is necessary and of course good to know Church dogma and know the Bible. The final line of this paragraph is critical. Without a firmer understanding of the Faith, all Christians, regardless of rite or confessional orientation, are likely to be lost — unless, of course, the liturgy is watered-down in its essentials to little more than an “entertaining gathering” or “subjective expression” intermixed with hymns and Biblical readings. The liturgy cannot be a true “public work,” a corporate expression of the Church’s prayer, without a common understanding of what is being expressed and why. While many Christians, thankfully, intuit that all liturgy, when properly served, is for the glorification of God and an experience of the eternal, that has not been enough to sustain the liturgical culture of the Catholic Church over the past 50 years. Orthodoxy, on the other hand, remains relatively “safe,” at least to the extent that a certain “museum mentality” prevails. But how long will that last? And when it eventually disintegrates, what horrors might follow? Gabriel, I am going to agree with the Metropolitan here. The novus ordo is indeed simply an odd collection of bits and pieces, put together by a committee and lacking in both liturgical flow and theological seriousness, and in the English version a language bordering on more than simply the banal. It is insipid and is about as inspiring as a high school lecture expounded a the most boring teacher imaginable. My own last two visit to this liturgical banality have been funerals. The last one, for a Sunday school teacher at the parish, was indeed bits and pieces; mostly along the lines of amateur music and dance hour. For no apparent reason, people would move to the front, sing some really godawful musical pieces, all accompanied by a guitar. The children of the parish did a mime in this individual’s memory, in rap. During the “offertory” the children then danced up and down the church, all was followed by clapping. Oh, and someplace in the middle of this, someone dressed in some sort of sheet thing, tootled up to a desk said some words, all the while smiling blandly at the audience, and then everyone waddled up and received a round piece of bread from several ladies. I was told this was not too much different than the normal Sunday service. Quite honestly, even the Protestants are better, they at least often still have reference. Oh I should also mention that recently I had a conversation with a novus ordo Catholic who had recently returned from Paris, she attended Mass at the nearest parish church, and stormed out because it was an Orthodox church and she would never attend the services of schismatics…it was st nicolas du chardonnet. 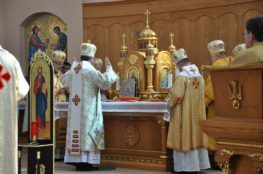 When the average, raised only in the novus ordo, confuse the traditional Latin rite with an Orthodox parish, there are real problems.